Most unique and well finished Dutch built expedition vessel! 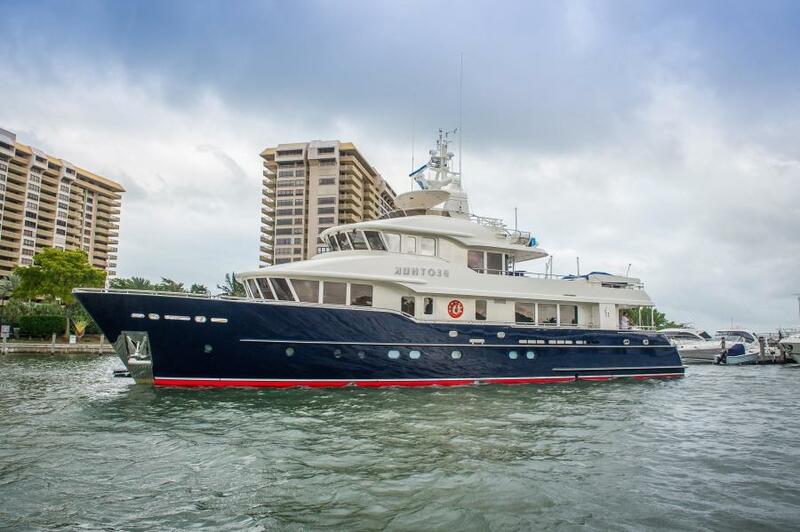 United Yacht Sales New Jersey would love to guide you through a personal showing of this 102' Kuipers Woudsend Bv Doggersbank Offshore 2008. 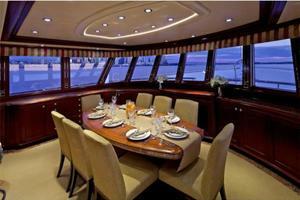 This yacht for sale is located in Naples Italy and priced at $9,710,000. For a showing please contact us by filling out the form on this page and we will get back to you shortly! The name BEOTHUK comes from the indigenous people of Newfoundland, Canada. The man that had BEOTHUK designed and built was from there and chose to honor them. He cruised this isolated area and further east where the BEOTHUK roamed.The second owner of BEOTHUK was an adventurer too and crushed the northeast passage through the Arctic Ocean and the Pacific Coast of Canada and the USA.The current and third owner of BEOTHUK has cruised from St. Barts to New England with many steps in between.BEOTHUK has performed remarkably well for all three owners and even lived for awhile on the shallow West Coast of Florida proving her versatility for many types of cruising. She is a remarkable vessel that can be run by a competent small crew. 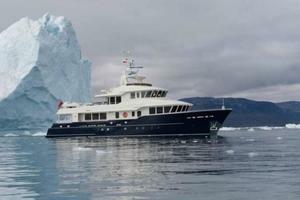 BEOTHUK captures the very essence of an expedition yacht, a rough and rugged vessel capable of traveling to out-of-the-way destinations like BEOTHUK's recent trip across the Northwest Passage just below the North Pole. 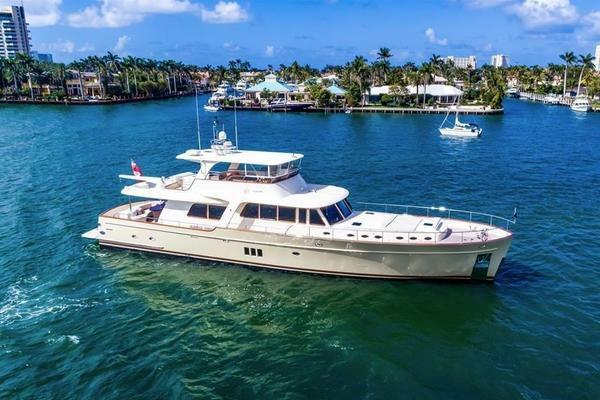 Yet ‘rugged vessel’ belies BEOTHUK’s extraordinary exterior lines and interior features which make her a yacht that rivals any cruising the high seas today. With superb fit and finish, stainless steel and joiner work, marble inlays, and exquisite granite, lighting and entertainment systems, she offers creature comforts for hardy seafarers. 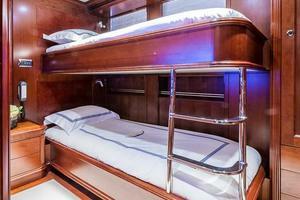 BEOTHUK offers three staterooms for six and two crew cabins. 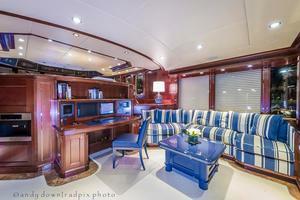 She features large main and dining salons, a sheltered aft deck, and a dramatic pilothouse and upper skylounge. Offering full displacement, she holds 11,200 gallons fuel for a long range and is powered by twin C18 DITA Caterpillar engines.BEOTHUK is the ultimate in both function and in appearance for a yacht! 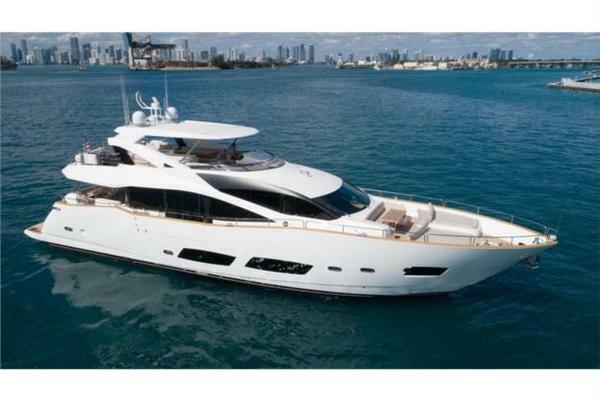 Rarely does a yacht of this caliber become available for sale. “Beothuk” was designed by Vripack Yachting International, Sneek, The Netherlands and construction completed by Kuipers Shipyard, Woudsend, The Netherlands. The design was very carefully reviewed and included: tank testing, wave pattern analysis, intact stability analysis and dynamic stability analysis in various loading conditions. 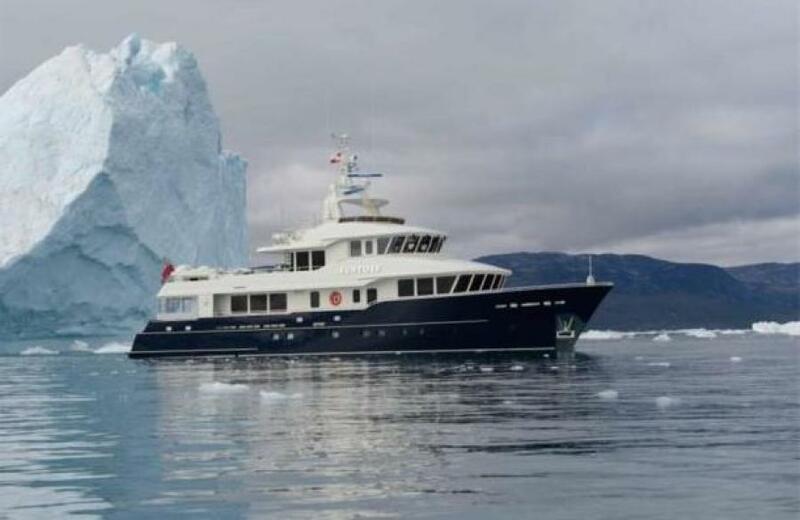 The owner previously built an 84' Vripak Kuipers and had extensive input on BEOTHUK'S design and construction.The yacht is a twin screw, round bilge displacement hull, with a flared bow, transom stern and four decks. 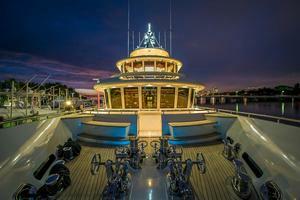 The hull construction is of welded steel and the superstructure of welded aluminum, they are joined with Triclad. The steel hull and aluminum superstructure are to Det Norske Veritas classification. There are 5 watertight bulkheads meeting MCA and other relevant IMO requirements for one compartment status with regard to flooding and damaged stability. 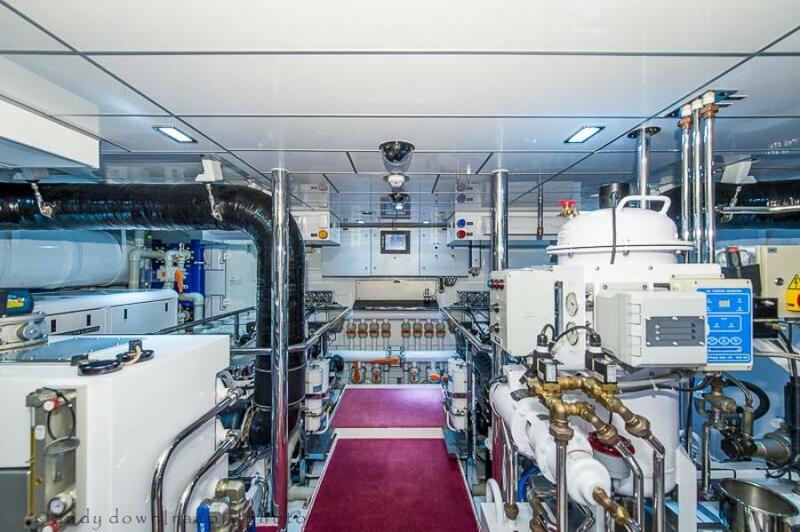 The design requirement was for intensive cruising capability and frequent positional ocean passages with time for regular maintenance and drydocking limited hence the emphasis on simplicity of maintenance and reliable systems and equipment.The exterior “Yachtglass” windows are made up of 4 layers of chemically hardened and laminated glass to DNV classification for offshore operations without storm shutters. The window frames are fabricated from a single piece aluminum welded into the structure. The exterior is faired and painted to blend with the house sides. This construction provides ease of maintenance without the typical exposed frames and fasteners together with a frameless window system. Generous use of high quality mirror finished polished stainless steel in particular: oval handrails, complete anchorarrangement, deck level vents, hinges, brackets, fastenings, bollards, chocks, ladders and stairs and deck hardware, etc.The upper section of the arch is hinged enabling a reduced air draft should it be required.Interior hardware is all high quality. 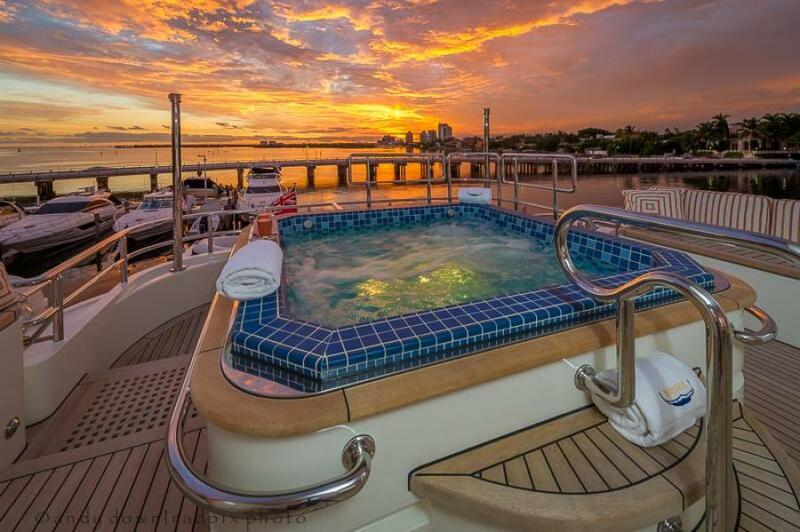 For example Dornbracht faucets and fixtures, Swarovski knobs, Jado hardware, stainless steel latches, etc.All ceilings throughout the yacht are of high quality leather.Teak exterior deckingThe Freeman Marine exterior doors and custom deck lockers are a combination of weather tight as well as water tight, depending on the location of the door.LED lighting is exclusive throughout the entire yacht, in many instances, it is fully dimmable.Bilges, technical areas and the engine room are painted white with a two part epoxy coating.A brief outline of the paint system:Primers are Awlgrip Base White 545Superstructure exterior is International Oyster WhiteHull Awlgrip Flag Blue PerfectionEngine room and lazarette International Matterhorn WhiteStorage and Pump Room International Undercoat Gloss 9010The entire yacht is extensively acoustically insulated with a variety of materials to provide maximum privacy and comfort.In addition antidrumming plates are fitted throughout. 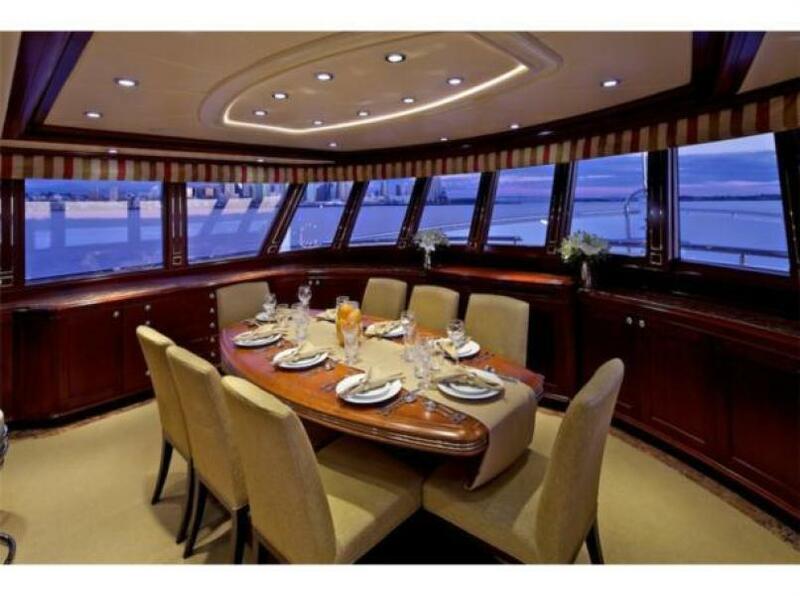 The Aft Deck provides a lovely sheltered atmosphere doubling both as an entry area from either the passerelle or the swim platform. It is an ideal setting for relaxation or casual dining. 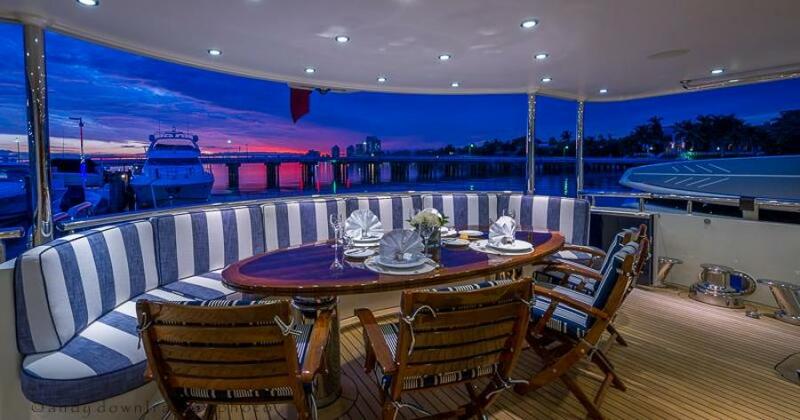 It is sheltered overhead entirely by the boat deck, which combined with the polycarbonate removable windows around the sides, aft and wing doors creates a totally enclosed area. The side deck wing doors provide a very well sheltered environment. The wing doors are recessed in the bulwarks when open and can be dogged when close in stormy weather. The oval varnished teak table top is highlighted with a wood inlay and 4 varnished wood chairs around the forward area and having seating aft. The table is mounted on two polished stainless steel pedestals. 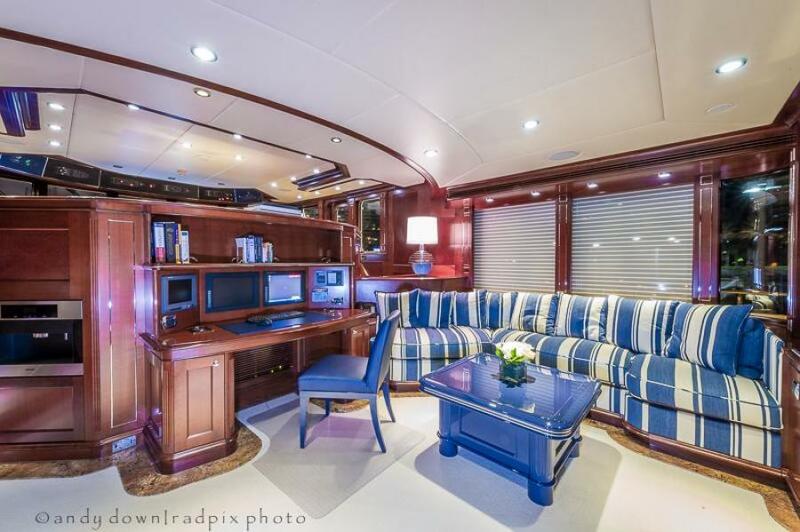 The aft settee upholstery is a medium blue with a white pattern.Forward on the port side is a full service bar with a built-in Sub-Zero two drawer refrigerator, generous storage and a built in Sub Zero ice maker. The bar is finished with beautifully varnished teak cabinetry and Labrador Blue granite counter top. On the starboard side is one of two engine room access doors. Adjacent is the curved stairway to the upper deck. This stairway is covered by a hatch insuring the aft deck is protected. 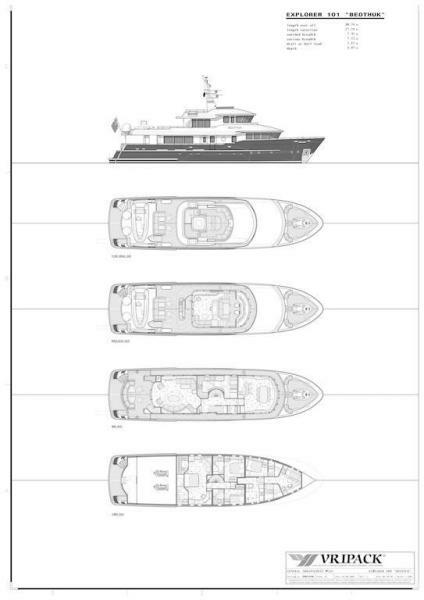 The aft deck area can be expanded by incorporating the main salon with the doors open to create a climate controlled environment even in cold and wet climates. Aft are lighted nooks with limited edition sea life art work by Medina. Original paintings and sculpture art works. Coffee table accented with a subtle inlay of an old square rigger sailing ship with drawers on four sides. Game table with pull out beverage holders and wooden inlay chess board. Crystal stemware all beautifully stored in sea going compartments. An original oil painting is behind the bar. 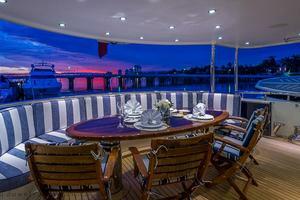 Owner's SuiteThe Owner’s Suite is located aft and full width of the yacht. 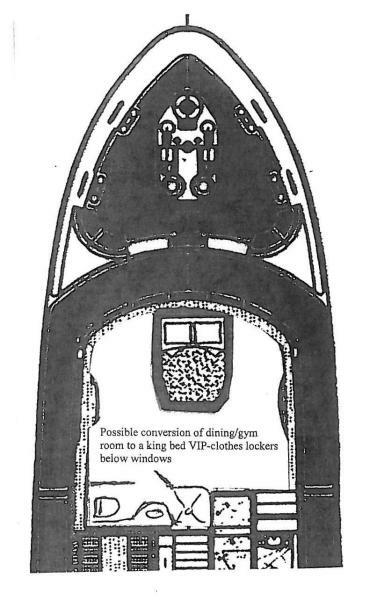 Center line is the walk around king size bed with night stands on either side. Starboard is a small desk surrounded with book shelves and a variety of drawers. 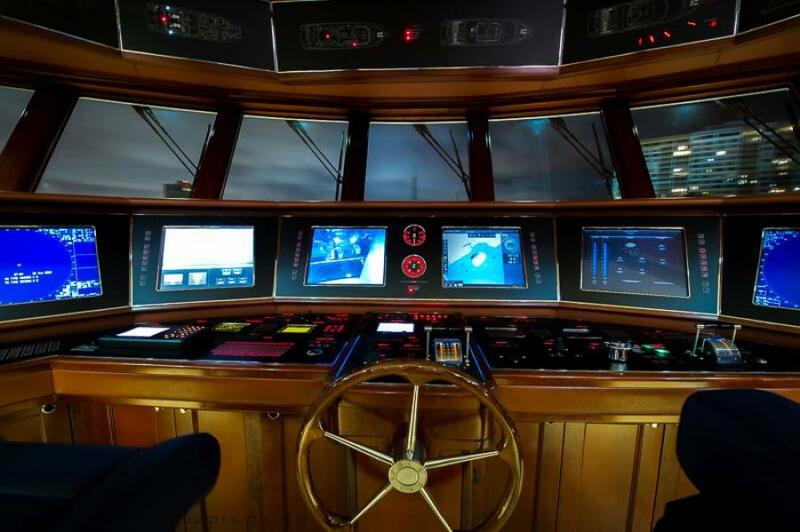 There is computer access for monitoring most wheelhouse functions and access to the Fleet 77 communications and internet system. Forward to port is a corner lounge and storage. There are a variety of LED lighting options and port lights with drapery on either side. There is a full entertainment system including a NEC LCD television. Aft to port is a full height cedar lined walk-in.VIP Suite Just forward from the owner’s suite are the two double guest staterooms. 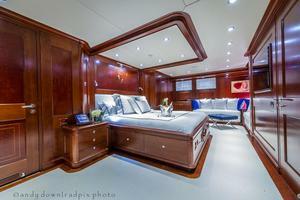 The port side stateroom is larger serving as a VIP suite. There is a queen walk around berth with night stands on either side. Aft is the ensuite bath with large stall shower. The marble floor is heated. 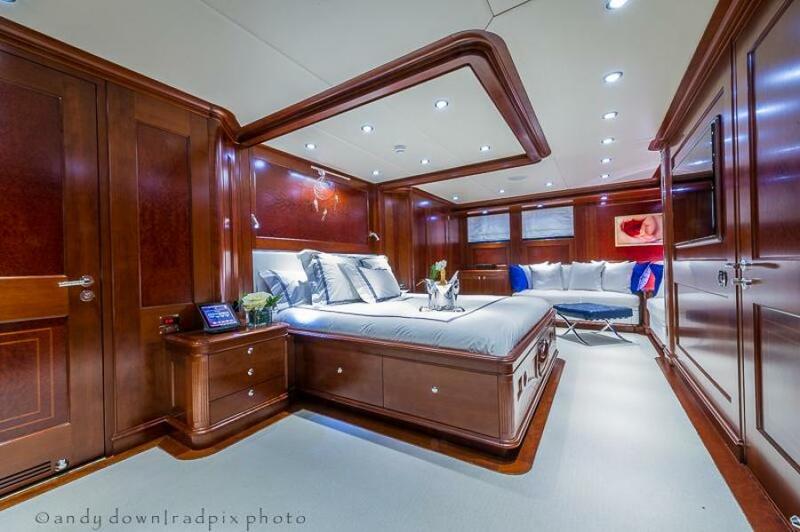 There is an emergency escape route to the captain’s cabin concealed behind the bed headboard cabinetry and sealed with a water tight door. 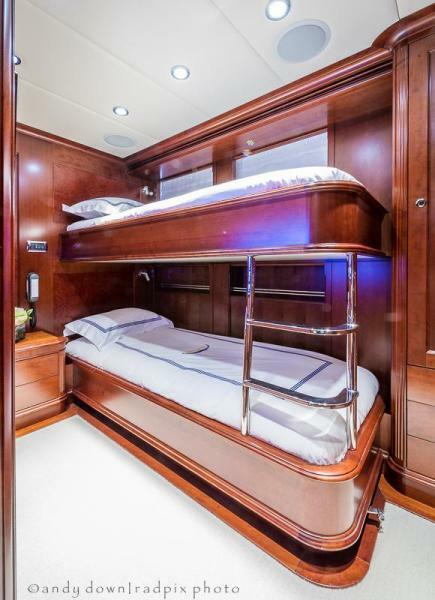 There is generous storage with two full height wardrobes.Guest StateroomThe second Guest Stateroom is on the starboard side. Outboard is a twin upper and lower berth arrangement. Storage drawers are below and a night stand is adjacent to the lower berth. There is generous storage and two full height wardrobes. Aft is the ensuite bath with large stall shower. The marble floor is heated. Storage is under the elegant curved stairway to the main deck in addition to the adjacent full height linen closet. This storage area also contains a hatch to access the cofferdam as well as the stabilizer rooms. This hatch also forms part of an emergency escape route.This stair is a work of art with carpeted treads and highly polished stainless bull nosed leading edges. The curved cheery wood hand rail blends in to the surrounding cabinetry. The design creates an atrium effect from the cabin deck.DayheadThe Day Head is located forward of the main salon and accessed from the main deck central corridor. The heated floor is finished in granite, matching the main floor as well as the salon border. The walls and vanity tops are Onyx. 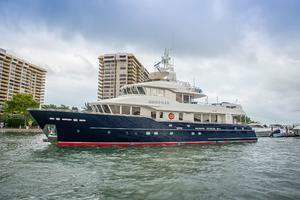 To starboard is a deck access door and the stair to the pilot house and upper deck lounge. To port is the curved stairway to the lower deck owner staterooms. 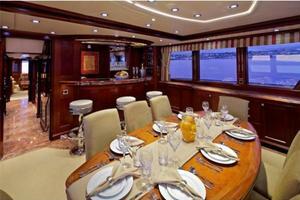 Forward is the galley interior entry and further is the dining salon and pub style bar. All galley glassware, flatware and china are stored in sea going compartments and special holders. The Entertainment System is made up of a fully populated Kaleidescape system capable of storing hundreds of movies as well as several thousand CD’s. The system has five players making it possible to watch different movies in five locations all simultaneously. The outputs are routed through an Extron A/V switcher making it possible to direct the players as required. 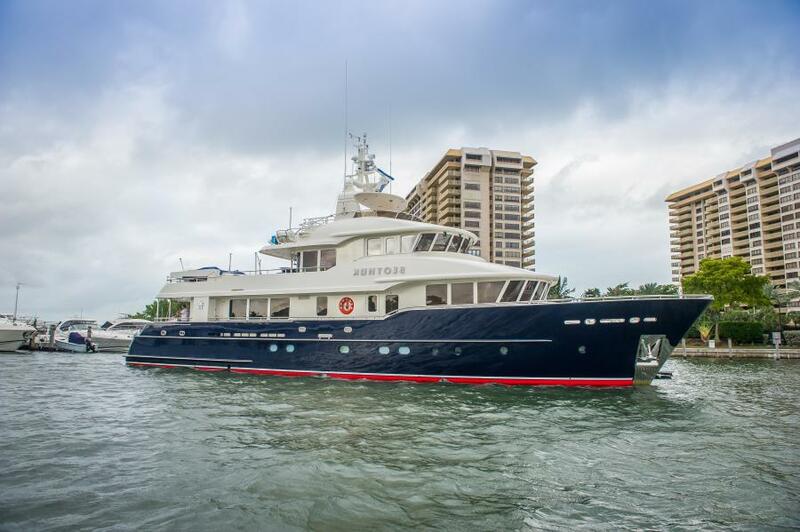 The system also has six DirectTv satellite receivers and 4 FM receivers all routed through the Extron for maximum flexibility.Throughout the yacht is Crestron touch screen technology. Control screens are available in all cabins as well as the common areas. 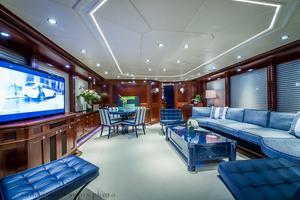 In addition to the audio and video all of the yachts lighting and window blinds are controlled through Crestron touch screens or individual wall mounted panels. All of the cabins as well as the common areas have manual connections for personal ipods. The Crestron system has the ability to display on any TV screen any of the selected wheelhouse presentations. For example you can watch the navigation system in the Main Salon or at other locations that have a television. 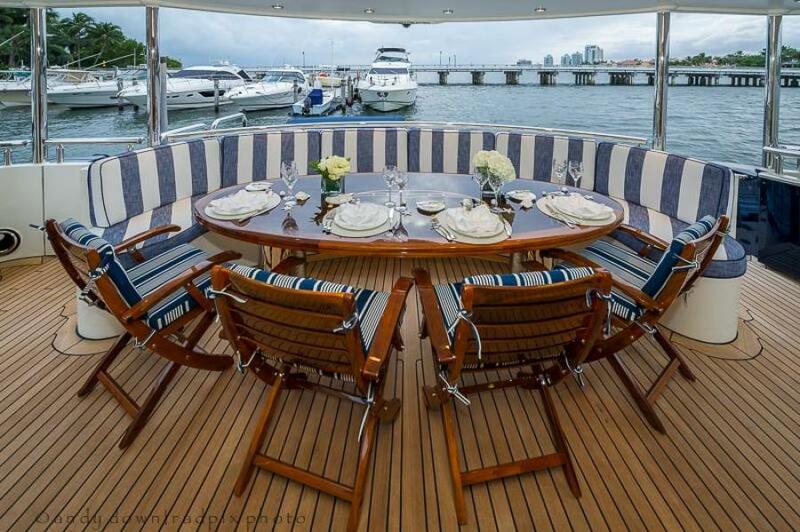 Boat Deck The Boat Deck offers a private and sheltered open environment. There is a crescent shaped built-in lounge aft with a large pedestal table. This table has a removable center section for ease of access creating two smaller tables if required. Separating the sky lounge and the exterior lounge is a large multi purpose bar and BBQ. The bar houses a twin electric Wolf BBQ grills, dual Sub Zero refrigerated drawer storage, sink and general storage lockers. The bar top is Labrador Blue granite as are the pedestal shelves on either side. An optional retractable sun awning that covers the lounge can be deployed when desired. The Jet Ski is typically mounted in this location especially in heavy sea conditions; however it can be alternatively stored on the swim platform. 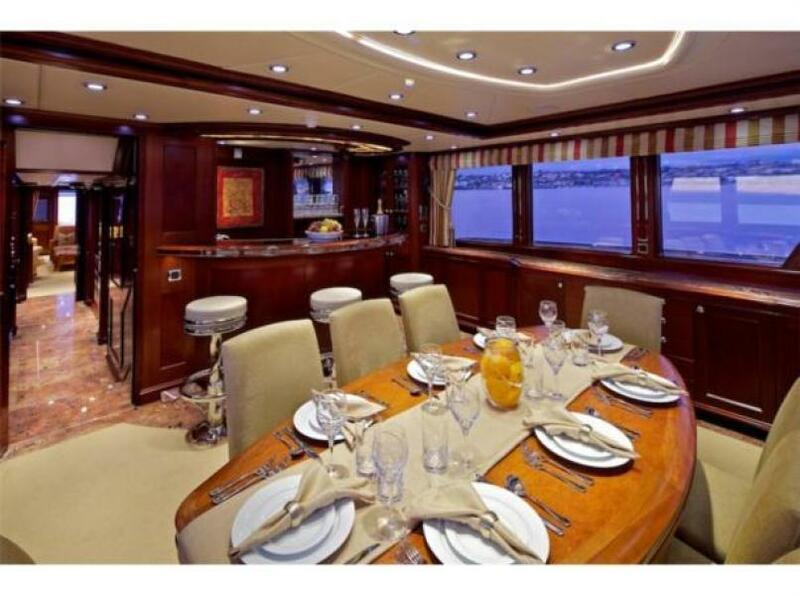 The decks are teak and the side decks provide an easy walk around including the Portuguese bridge. 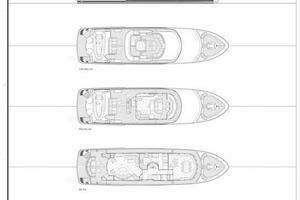 The design offers a number of options for guests and crew access. Aft starboard is the sheltered stair to the aft deck. On either side are built in storage boxes with lockable water tight lids.Built into one of the lockers on the Portuguese bridge in front of the wheelhouse is an electric Glendenning hose reel with fifty feet of hose. This can be used to quickly wash away heavy salt from the wheelhouse windows while underway without the necessity of having to struggle with a wash down hose. The cranes which are positioned on either side provide tender launch options. 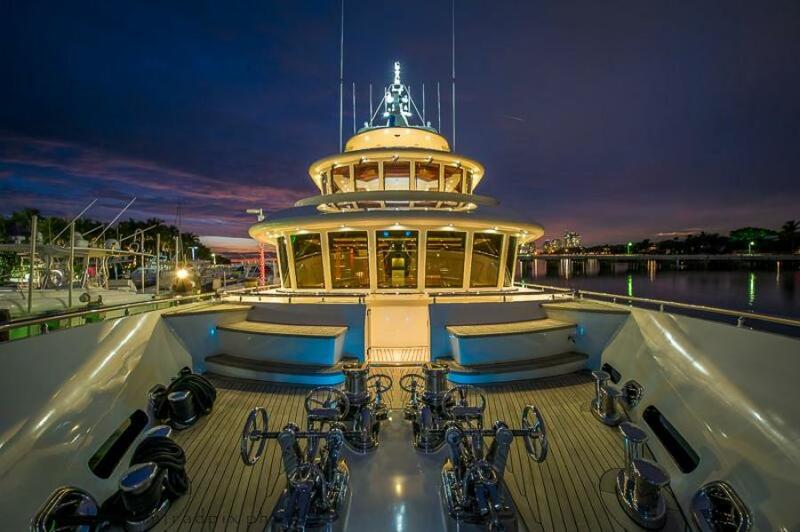 This entire area is very well protected with high bulwarks topped with gleaming mirror finish polished stainless steel railings.Sun Deck The Sun Deckis located above the pilothouse and sky lounge and is accessed by the etched glass stairway housed a gleaming polished stainless steel frame. The sun deck offers privacy along with a magnificent panorama. 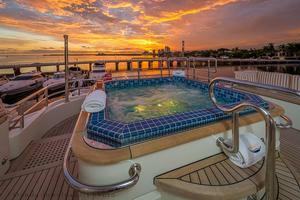 Aft is a raised Jacuzzi style hot tub. It is finished in ceramic tile over the stainless steel tub. On either side are built-in storage boxes with locking lids and forward surround seating is on the side. The cushion fabric is green with a white pattern. Centerline there is a twin raised observation lounge that also doubles as a helm seat. 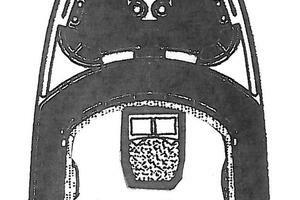 Concealed in the forward locker is a helm station that cleverly hinges up for use. The overhead arch offers a variety of lighting options. Castoldi 18’ RIB inboard 120HP Yanmar diesel, jet driven center console well equipped tender. The tender is complete with sounder, VHF, stereo, etc. Hydromar hydraulic passerelle. 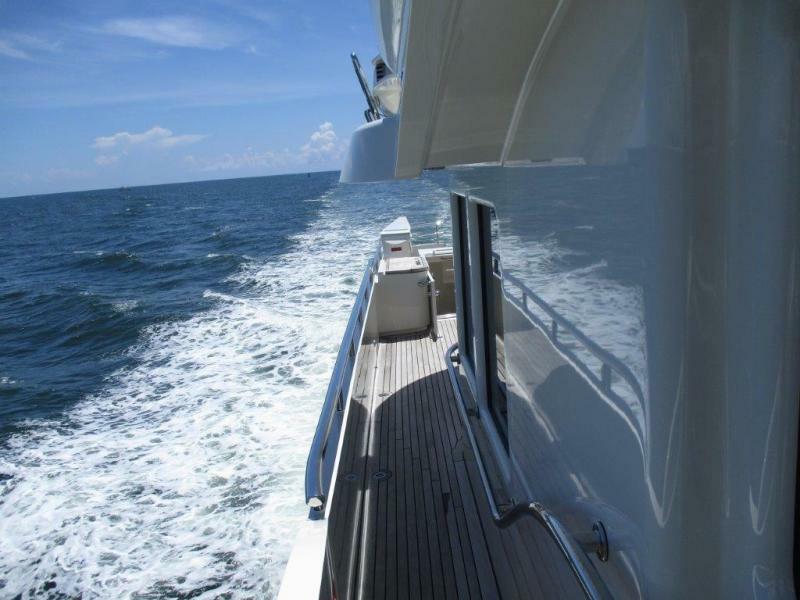 The passerelle is constructed from highly polished stainless steel and is capable of moving 80˚ starboard, 110˚ to port, 10˚down and 20˚ up. It is also designed as a secondary crane for locating the Jet Ski on the swim platform. The passerelle has an eighteen inch step on the end and this step stays level as the passerelle is raised and lowered through its 30˚ degree range. The passerelle also removable stainless steel railing stanchions on each side. The railing is stored in the lazarette. (2) 3300# Hydromar hydraulic tender cranes, one on either side of the boat deck. The booms telescope to approximately 16’ and rotate 300˚. The cranes have a 1500KG rating fully extended and are constructed from stainless steel. Twin Northern lights 55kW @ 1500rpm 50Hz 400v 3 phase generators in sound boxes. All starting batteries as well as the house batteries are gel cell. Ventilation system with a controlled fresh air mixer to exchange a regulated percentage of fresh air. The outside air makeup can either heated or cooled as required. CCTV cameras in critical locations. Combination of various line sizes and lengths. A variety of fenders for almost any situation. Custom fender hooks by Mega Fender sized to fit all of the various railings and docking situations. Eco 510 Seapilot with a number of input options i.e. Fluxgate, Gyro, Solid State Gyro, NMEA or Aux which in this case is the input from the Rate of Turn Pilot. With the radar setup on Beothuk it is possible to select the “X” band scanner to the “S” band processor electronics and display and vise versa. This provides maximum flexibility and redundancy between the two radar systems. MX 420 Navigation system with AES and electronic gyro. A cathode protection sensor is installed in the hull and monitored through the DMP system. (2) Independent Nobletec Max Pro navigation systems on separate computers. Port side chart drawers and chart table. Remote control for the water maker system. Carlisle & Finch Search Light with pan tilt and focus. (4) Kahlenberg Horns with automatic controls and sequencer built in the dashboard. Two Stork Quant throttle controls and three steering locations: The rate of Turn Pilot is located on the Arm of the Helm Seat. 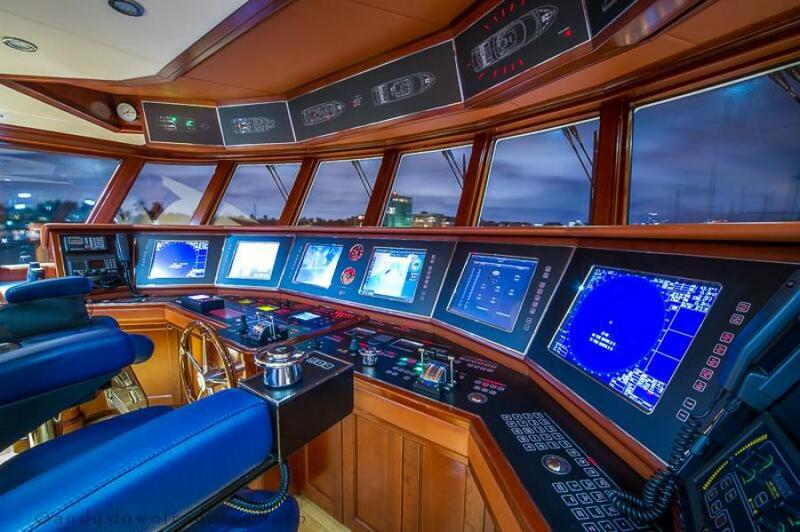 The watch stander has the option when any position other than NEMA is selected of the Main Pilot to operate the vessel from the small on dash control or select the ships wheel in the center line of the console and steer from this location. This center location has its own Stork Quant throttle control in close proximity to the steering wheel. There is also a backup to the electronic Stork Quant control providing the operator the option to bypass the electronics and control the engines directly.Ships systems monitoring (Mimic) panels with a graphic representation of the vessel giving a visual indication of all pumps when running, smoke and fire detectors, outside temperature, wind speed and direction to the vessel, bilge high water alarms and navigation lights. If there is navigation light failure the indicator on this panel will blink the location of the fault. These are all displayed in the six overhead panels. 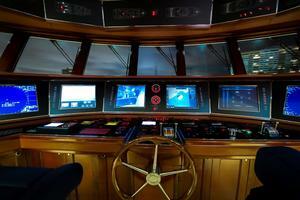 There are over 800 points throughout the yacht monitored. Twin air compressors along with compressed air storage tank and Compressed air outlets, there is also a compressed air outlet in the locker on the Foredeck. Remote refueling hose for the tender (2)100 Amp 3 phase input 60 kVA Atlas. The inputs to this unit can be any combination of single phase, 3 phase, single 100 Amps, dual 100 Amps, or there are two Atlas Smart Boxes that can also receive up to four 50 Amp plugs. There are pig tails and connections for all possible combinations. 25 kVA Atlas 60 Hz unit. Stainless Steel power cable storage drums are connected to the Glendenning’s, these are remote units. Stainless Steel telephone cable and Cable TV cable storage drum connected to the Glendenning system. Glendenning hose reel and hose for filling the fresh water tank from the Swim Platform location. Underwater ROV robot with a 200’ theater. The ROV has an onboard color camera, a remote control mechanical grabber as well as underwater lighting. The lazarette has a video and audio input for the ROV for feedback to any of the onboard TV’s. 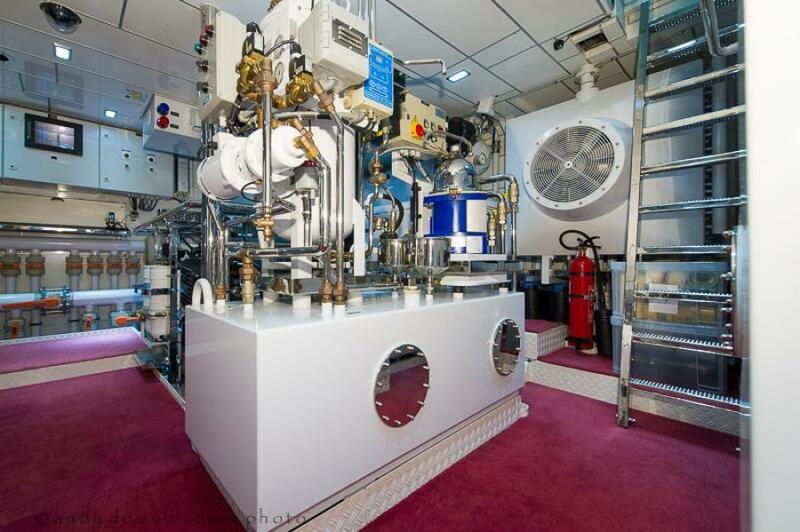 The engine room is a work of art finished is high gloss epoxy white paint, polished stainless steel everywhere, chrome, carpeted floor over easily removable diamond plate powered coated aluminum flooring and it is air conditioned. There is exceptional lighting everywhere and a configuration that will please the most fastidious engineer. Blue Tooth noise suppression headphones enable communications with the machinery in operation. A number of high quality sensors provide a visual LED readout of such functions as the engine backpressure, the flow rate and temperature of the sea water on the primary side of the plate heat exchanger and the glycol flow rate and temperature on the secondary side of the plate heat exchanger. The same sensors monitor the supply and return temperature of the fluid as it leaves the engine room and goes to the primary side of the Air Conditioning system located in the pump room. The pump room has sensors that monitor the secondary supply and return. The outputs from all of the sensors are then monitored through the DMP system.New Oil & Waste oil pump plumbed to each of the main Engines, Generators and the Transmissions and the flow is monitored through the DMP system. Both new and waste Oil tanks are plumed to the exterior fuel fill locker where it is possible to fill new oil and pump out waste oil.Battery transfer box gives the option to transfer batteries from any piece of machinery to another piece of machinery or to utilize the house batteries for starting batteries in an emergency.The Alfa Laval titanium plate heat exchanger system is utilized for cooling the engine room air and the air conditioning compressors. Glycol is circulated; salt water does not enter the equipment itself. The plate heat exchanger is protected from marine growth by an electronic cathode protection system referred to as the Magic Growth system. The system has five year electrically charged copper and aluminum anodes in each of the two sea chests. A spare set of anodes for each sea chest is included. 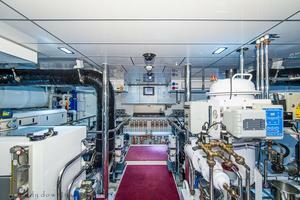 Engine room ventilation and cooling is handled from a proportional fan system capable of maintaining the space with machinery in operation at approximately 2˚above sea water temperature. 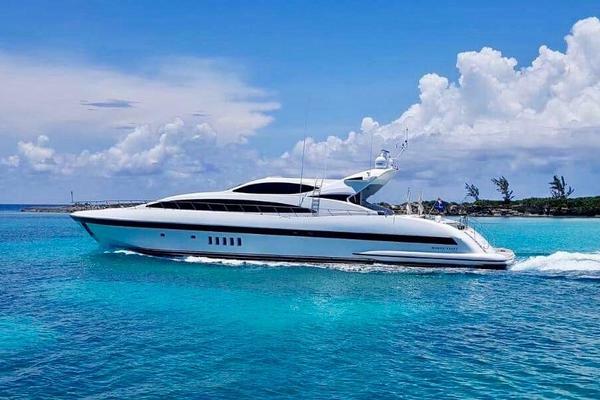 The temperature is electronically controlled by the H&H monitoring system the same system also monitors and controls the Engine Room positive air pressure while underway. The Sky Lounge is aft and down a couple of steps. The centrally positioned desk is forward and part of the cabinetry so that it blends into the environment. On top of the book cabinets separating the wheelhouse from the lounge there is a beautiful sea life art work by Medina. There are two 15” computer displays (8c omputer displays in total including those in the pilot house) offering a variety of options together with the Furuno Navtex and Felcom displays. Built into the cabinetry are controls for both the X and S band radars. These radar controls are in addition to the principal helm operational stations.A Crestron portable control for lighting and entertainment is in addition to the built-in control panels. The area has its own on board personal computer that is connected to the Fleet 77 system built into the adjacent table is the printer. On the starboard side is a comfortable built-in settee upholstered in tones of gold and beige. The neutral gray carpeting is surrounded with a granite border. 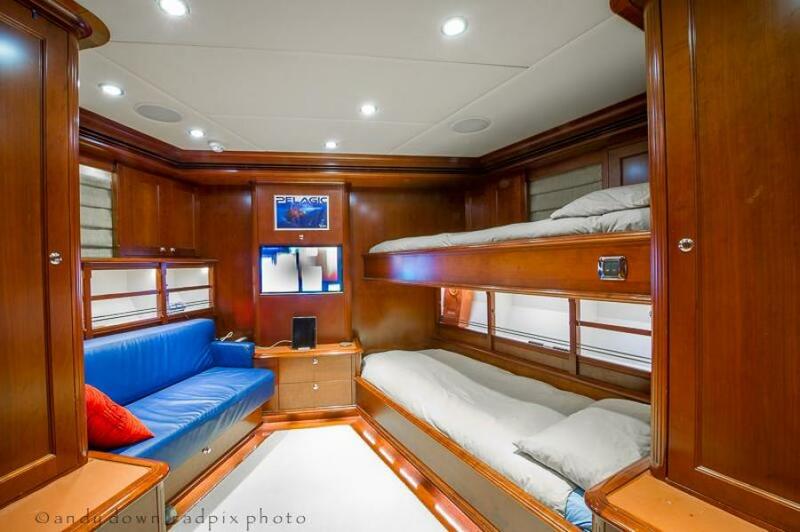 The port side cabinetry affords storage, a hiding place for the 42” LCD television and a two drawer Sub Zero beverage locker. The wheelhouse lounge also has its own Miele coffee maker (same as the Galley unit).On both sides and aft are noticeably large windows providing a pleasant open atmosphere. The aft corner windows are curved and dramatically open the lounge to the outside environment. The side windows have adjustable Hunter Douglas Silhouette motorized blinds. There is virtually a view in every direction. 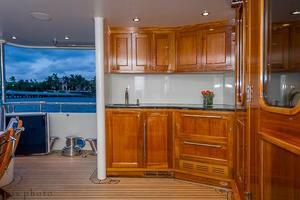 Aft is the door to the boat deck and the upper sun deck stairway. Ample space is provided for tank cleaning and maintenance access. Black Water: (polypropylene) If the black water tank is used or if the Headhunter is pumped into the holding tank the option is there to pump the black water tank overboard or there is a deck pump out in the forward dodger. A. 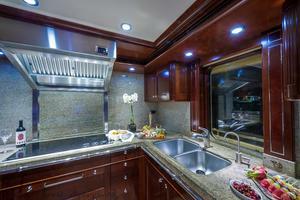 Converted the entire boat to HD new TV sets, satellite antena and crestron converter. B. Added a flir camera and upgraded nav computers and distribution. C. Stabilizers were serviced with new hydraulic rams and ram bearings. D. Shaft work was performed by advanced mechanical with a clean vibration survey. E. Spot zero added for spot free rinsing. F. 25,000 dollars worth of new batteries. G. Added new KVH mini VSAT. H. Whole new network is now aboard. I. Extensive electrical upgrades preformed by Wards Marine Electric. J. Teak decks sanded. K. Anchor pockets and anchor were extensively polished. L. Serviced generators and main engines with valve adjustment and heat exchanger andaftercooler cleaning. M. A complete interior and partial exterior decor upgrade was completed in November, 2013, consisting of carpets, fabrics, and soft goods are shown in the photos. Owner’s personal effects.A sale inventory will be supplied at the time of an acceptable offer.